John and his wife have been renting properties since 2012. They have 3 properties in the same area. 2 properties are located on the same street. The properties have received 5 star reviews from previous renters for being provided clean, beautifully renovated cabins at affordable prices. John and his wife have been home owners in this area since 2000 and enjoy retreating away to the White Mountains all year long. John and his wife love the area due to being so centrally located and many things to do within short distance. Brand new full bath with beautiful granite counter tops. Pots and pans and all accessories to make meals for 6 or 7 people. Fully equipped brand new kitchen with beautiful granite counter tops and pine custom cabinets. Beautiful tile floors. 3 Seat island for extra seating and a kitchen table that seats 6. This was our second stay and it was wonderful again. It is less than 20 min from King Pine. The house is open modern and clean. Terrific for skiing with a family! We rented the cabin for Christmas. Upon arrival the kids were very excited to see snow on the ground. As we enterned the cabin I was very excited to see how spacious the unit was. Since we were celebrating the holidays we had enough room to put up a Christmas tree and we enjoyed ourselves by playing family games, baking cookies and watching holiday movies. This cottage is absolutely perfect for a family getaway. Thank you for an amazing family getaway. We definitely plan on renting this unit again. A great home base to enjoy all NH has to offer. Hiking and climbing we did it all, and had a great place to return at the end of the day. I was impressed by the quality of the house, obviously a new build. Beautiful cabin and very clean. I loved the smell as soon as I walked in...the pine walls. We had a great time. Beds were comfortable. Everything we needed was in the kitchen. We forgot our towels, but John let us know where we could get some. Had a little trouble getting heat to the back bedroom, but we figured it out. Never did get WiFi for our computer, but that was OK. Our weather was not very cooperative at all. Rained for 2 whole days and then 2 more days of dreary skies and lots of fog. It was just nice to get away and take some day trips. Conway train ride was great...the only sunny day we had. Never saw so many Dunkin Donuts' in my life...WOW!! Wish we'd been able to see a moose. We did eat at the Muddy Moose Pub in Conway...excellent and nice atmosphere. This classic New Hampshire home will make you plan a vacation up here several times a year. In the warmer weather there is close access to a beautiful beach on White Lake.only five minutes from club motorsports. Enjoy 'motor-boat free' swimming or take a kayak, canoe or paddle boat for a quiet tour of the lake. Amazing views of Mt Chocorua make the beach even better. In the winter, hop on your snowmobile and have direct access to Corridor 19, which you can ride on for days! Just 15-20 minutes to Mt Cranmore and King Pine Ski Resorts for skiing and tubing. 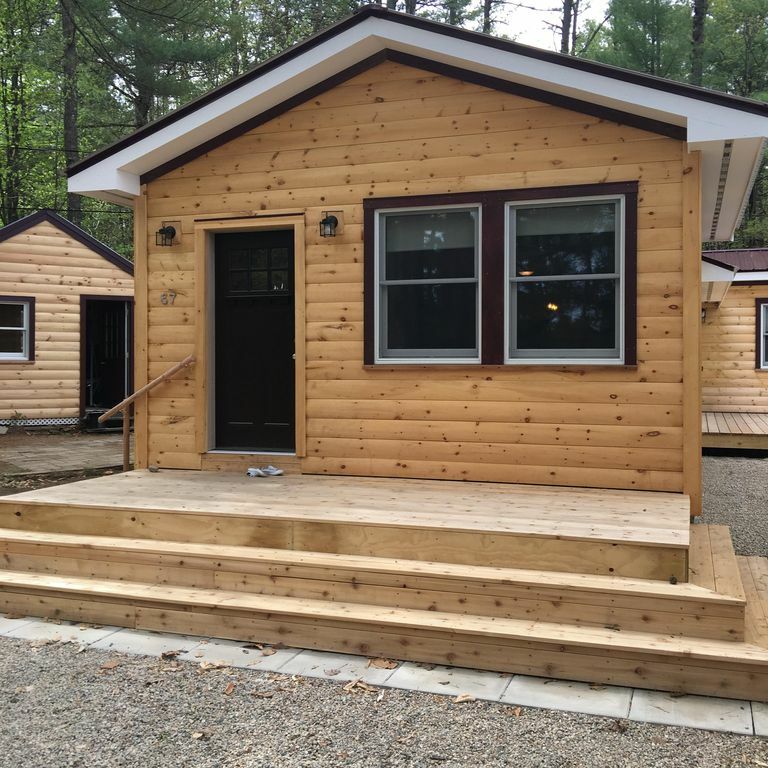 Back to the house - this is an open concept newly renovated cabin ideal for entertaining. Fully equipped kitchen and living room with wood stove. There are three bedrooms - including one queen, one queen, and a full size with twin above bunk bed. One full bath with tub. Full kitchen with granite counter tops. This home has pine interior. This house has so much to offer. Centrally located to many attractions in the White Mountains. 15 minutes to North Conway, 20 Minutes to Lake Winnipesaukee, and 10 minutes to Lake Ossipee. There is also a beautiful outside area with a fire pit and a porch with a gas grill. Location: The house is located in Tamworth NH. Outside: There is a gas grill, nice size yard and parking for three cars. Amenity: Queen, Queen and full/twin bunk bed. Air conditioning. Attractions: Enjoy swimming, boating, skiing, foliage, shopping, snowmobiling and hiking in this year round home. Just minutes to the kancamagus highway.